I’ve had my head jammed into maps all week for Book of Exalted Darkness (they are nearly finished so I can get to layout!!!) but no design and all cartography makes Mike a dull boy. When somebody on Facebook asked about doing Attack on Titan in D&D 5E, since I’ve already got something akin to it in Pathfinder (for free; it’s the Beztekorps PDF for Veranthea Codex) I converted it over. NOTE: If you are only here for the class, scroll down to the bottom. South of the Scorched Desert and north of the water-borne realm of Srendath, the Dry Walkabout stretches from the Burning Sea across large spans of desert to the waters of the Koprik. A savanna filled with enormous predatory beasts, and ruled over by powerful tribes of taiga giants—the only marks of humanoid civilization are relatively recent heavily fortified city-states of halflings and gnomes. These small folk control the vast majority of freshwater sources in the region, as well many magical springs that provide an endless supply of ankshirr water. The enchanted fonts formed after The Scarring, when a devastating blow against Wealbrens sent the water deity’s essence touching upon the savanna. These exotic wells have caused the two forces within the region to clash for centuries as the giants found that the unique water turned them into incredible hunters, swift on the savanna and graceful in the kill. Daily, giants from The Nameless (CN)—the largest tribe in the Dry Walkabout—clash with the walled cities under the direction of their leaders, the venerable old Shoiree (CN male druid 5) and youthful Toorrahk (CN female barbarian 5). As The Nameless and other taiga tribes destroyed each pocket of resistance, it seemed as if the victory of the giants was inevitable. Gnomes and halflings—once common throughout the high grasses—had to band together and form cities as their former survival tactics crumbled as their enormous enemies began to traverse the savanna more swiftly than the small folk could compensate for. It was in one of these cities on the coast of the Koprik Sea, under the leadership of Pondere Beztegloven, where two things happened that changed everything. A spring of ankshirr water was found near the rapidly growing fortifications of Pondere’s stronghold, and a strange Trectoyri device washed ashore—the first sciobtha canister. With the help of Lehertu Reicio (LG gnome wizard 11), in a matter of days Pondere deciphered the device’s purpose and saw how to turn the tide against the giants. By drinking ankshirr water to decrease their already reduced weight and manipulating the expulsion of gas from the canister, the halfling and gnome were the first two persons in Grethadnis to master sailing through the air—a technique that has come to define the Beztekorps. After an intense first week and several unfortunate deaths, Pondere forged an elite team of warriors that could nimbly flit through the air. Using ankshirr water, innovative Reicio forged swords that cut through the taiga giant’s thick skins with ease. Wielding the superior blades and flying into battle, the halfling Pondere led their army to an astounding victory over the giants. Jumping onto the momentum of their victory, the rapidly growing Beztekorps reinforced the last desperate settlements that continued to resist their enormous enemies and for a little while it seemed as though the small folk were going to win back the Dry Walkabout. But the taiga are a spiritual people, and as the war turned against the giants, their leaders spoke more often with the deceased so as to gain valuable insight into the new methods their smaller opponents were using against them. The small folk took advantage of what they saw as a retreat to create enormous, high standing walls around the surviving city-states, utilizing ankshirr water to make the task almost easy. To ensure the protection of each city, one of each of the original elite warriors of the Beztekorps was assigned to a settlement, which they trained their own warriors to defend. Yet before long the halflings and gnomes saw their string of victories come to an abrupt, disheartening end, in a new wave of assault and horror known as The Reckoning. Having spoken at length to their dead kin, the giants learned not only how to best strike down the flitting halflings, but also how to fill them with fear. The first wave of defenders—all experienced warriors of numerous bloody battles—were slaughtered and eaten alive as the giants climbed the walls, Pondere Beztegloven herself disappearing in a melee of taiga warriors. Only after heavy losses did the small folk beat the giants back, veteran Beztekorps each using their own unique martial style. After The Reckoning, the city states banded together as the nation of Beztegloven and have remained in an uneasy stalemate with the taiga tribes, neither able to shift the balance of power permanently. Rumors of new springs of ankshirr water always interest both forces, but exploratory parties that strike out for them are often never heard from again—huge predators of the wastes being made all the more dangerous after drinking from the enchanted waters. Yet, it seems that new wells of ankshirr water spring into existence wherever the Beztekorps venture, even beyond the Great Walkabout. Increasingly, the aerial warriors have been skirmishing over them with the Red Fist orc tribes or Cedrazi pirates, and even far-roaming cultists of Trianestra. To stand against their seemingly inexhaustible and ever growing list of enemies within and without, the four city-states: Bronic, Pondere, Napasc and Oszukac, have begun seeking new alliances or capable Beztekorps fliers, whose skytrails are growing more common every day. Bronic sits far to the northwest and is lauded for their siege warfare and defensive flying techniques. Pondere, on the coast of the Burning Sea, is home of the ‘traditional’ and most maneuverable Beztekorps style, and is named after the group’s founder—Pondere Beztegloven. Napasc lays northeast, and houses the most foolhardy (but spectacular) aerial soldiers in the country while Oszukac, in the southeast, are the craftiest of the cities, masters of hiding their movements to catch targets off guard. SIDEBAR – Ankshirr Wells: The mystical water sources protected by the Beztegloven city-states are enormously valuable to any resident of the savanna. Their primary defenders—the Beztekorps—depend on it to fight off the persistent taiga giants. This vial of clear, fresh water is so incredibly light that if left unattended, it floats in the air of its own accord. Each vial of ankshirr water consumed reduces a character’s weight by 50 lbs. (to no less than 1 lb.). This effect lasts for one hour, but has no mechanical benefit until this has reduced a creature to at least half its original weight, at which point the imbiber feels the other effects of the enchantment. After imbing enough ankshirr water, a creature increases its Dexterity by 2 (to a maximum of 22), has advantage on Strength (Athletics) checks made to jump and Dexterity (Acrobatics) checks, is always treated as having a running start, and increases its speed by 15 feet. Ankshirr water can also be applied to inanimate objects, reducing their weight by 50 lbs. for 1 hour. The effects of a vial of ankshirr water last for 1 hour and if drawn from a naturally occurring source, cannot be dispelled. Sciobtha Propulsion: The Beztegloven city-states have mastered the art of capturing and pressurizing gasses. When used in conjunction with ankshirr water, sciobtha canisters can propel creatures through the air as if they were flying. Sciobtha Harness (15 lbs, 260 gp). This tight-fitting harness is made primarily of chains and thin metal plates, into which at least a half dozen brass canisters have been fit, each with nozzles pointed in different directions. These complex harnesses allow their wearers to carefully control the release of gas from a number of sciobtha canisters, granting them limited powers of flight. Being non-magical, these harnesses are extremely complex and any wearer without proficiency with the sciobtha harness has disadvantage on all checks made to use it. As a swift action, a wearer under the effect of ankshirr water can activate a sciobtha harness with a DC 12 Dexterity (Acrobatics) check, gaining a fly speed equal to twice their walking speed until the start of the wearer’s next turn. Doing so uses 1 charge, of which a fully charged Sciobtha Harness has 40. Failing this check by 4 or less results in the character moving double their base speed in a direction of their choosing, failing by 5 or more results in this movement being in a random direction. Characters not under the effect of ankshirr water gain no benefit from activating a sciobtha harness, but still expend charges. Recharging a sciobtha harness requires special technology carefully guarded by the Beztekorps, and generally costs 40 gp. A typical sciobtha harness is built for Small-sized creatures. For each size category above Small, the cost in fuel to use a sciobtha harness is doubled (so 2 charges are required each round for a Medium creature, 4 charges each round for a Large creature, and so on). This remarkably light metal is unique to the Beztegloven city-states, forged by the small folk of the Dry Walkabout who are able to easily integrate ankshirr water into the forging process. Armors made from reiciosteel are lighter, allowing the wearer to increase the amount of AC increase gained from Dexterity by 1 while wearing a suit of reiciosteel. Armor that does not utilize the wearer’s Dexterity gains no benefits when made out of reiciosteel aside from being lighter. Any item made from reiciosteel weighs one tenth (1/10th) as much as the same item made from other metals. In the case of weapons, this lighter weight does not change a weapon’s size category or the ease with which it can be wielded (whether it is light, one-handed, or two-handed). Items not primarily of metal are not meaningfully affected by being partially made of reiciosteel (a longsword can be a reiciosteel weapon, while a quarterstaff cannot.) Reiciosteel weapons count as silver for the purpose of overcoming damage reduction. Reiciosteel weapons are specifically designed to cut through the defenses of giants; against these targets, an attacker wielding a reiciosteel weapon gains a +2 bonus to attack rolls. Reiciosteel otherwise has the same statistics as steel. Masters of the sciobtha canisters and ankshirr water, these warriors fly through combat with astonishing ease. Crisscrossing the battlefield in rapid bursts of air, the Beztekorps slashes enemies as they streak from place to place, cartwheeling to and fro. Adventurers keen to make use of the Beztekorps’ amazing equipment (to fly through the air like a boss and slash up enemies) or harboring a hatred for giants will be right at home with this prestige class. To qualify to become a Beztekorps, a character must fulfill all the following criteria. 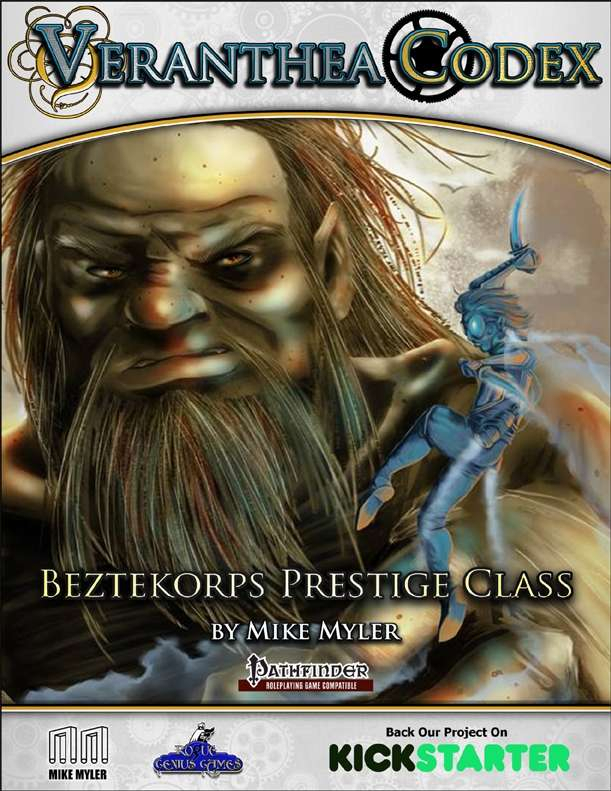 Taking levels in the beztekorps prestige class follows the same rules as multiclassing except where noted. As you earn higher ranks in the Beztekorps, you gain the following class features. You acquire a sciobtha harness, 10 vials of ankshirr water, two reiciosteel shortswords, and proficiency with the sciobtha harness. Aerial Bonus. Starting at 1st level, while you are in flight using your sciobtha harness you gain a bonus to AC, attack rolls, damage rolls, and Dexterity saving throws equal to one third your level in this prestige class (minimum +1). Rationed Resources. At 2nd level, Beztekorps have completed basic training and are all capable of creating ankshirr water. Once per day, you can create a vial of ankshirr water. In addition, you are normally provided with 5 vials of ankshirr water and enough sciobtha canisters to fully recharge a sciobtha harness each week. Ankshirr Catalyst. When you reach 3rd level, you become more accustomed to flying through the air with ankshirr water and your body becomes more receptive to the effects of it. Double the duration of the effects of ankshirr water to 2 hours. When you reach 8th level in this prestige class, you double the duration again (to 4 hours). Evasion. Beginning at 4th level, you can nimbly dodge out of the way of certain area effects, such as a red dragon’s fiery breath or an ice storm spell. When you are subjected to an effect that allows you to make a Dexterity saving throw to take only half damage, you instead take no damage if you succeed on the saving throw, and only half damage if you fail. Improved Reaction. At 5th level, your very nerves are as light and quick as you are! When you are fighting a giant, you gain an extra reaction each round, although this reaction can only be spent to make a melee attack against a giant. Uncanny Dodge. Starting at 6th level, when an attacker that you can see hits you with an attack, you can use your reaction to halve the attack’s damage against you. You may use your second reaction each round when fighting a giant to use this feature instead of making an attack. Slashing Charge. Beginning at 7th level, once per round after you have flown at least 50 feet and make a melee attack, you gain advantage on the attack roll. In addition, you may choose to take a -5 penalty to the attack roll to deal 10 extra damage on a successful hit. This feature cannot be combined with other features or feats that reduce the accuracy of a melee attack in order to increase the damage dealt. Aerial Dervish. When you reach 8th level in this prestige class, you no longer require Dexterity (Acrobatics) checks to operate a sciobtha harness. In addition, you can attack twice, instead of once, whenever you take the Attack action on your turn and are flying with a sciobtha harness.